Brownies are my weakness. It also is a hot favourite with all of my family members, so after a long hiatus and weighing the pros and cons of baking this sinful decadent dessert (which I absolutely cannot resist even though my weight goals are far from being achieved, I decided to throw self-denial of calorific food out of the window and just go for it even though I know that when I see these things sitting there, there is no way I will pass them without picking one up and shoving it into my mouth (at every pass) until they’re finished. 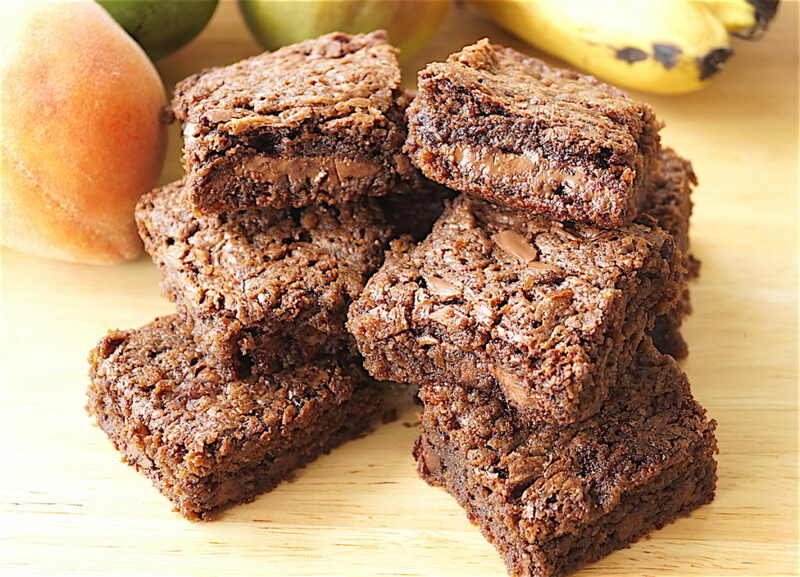 I normally make chocolate walnut brownies but this time thought to do something different and go for Nutella – hazelnut flavour being a big favourite of mine – and loaded them with chocolate chips. So, after working out some proportions in my head, this is what came of it. My kids raved about them, more I suspect because they have been denied pastries and candy this week as a result of overindulgence last month on holiday. The daughter actually said “I love them as much as Krishna loves butter’’! And the son threw out his usual pithy “awesome’’ and ate about four of them. Am not going to let that make my head swell because they have very little discerning powers where desserts are concerned. Anything sweet is amazing. And the combination of hazelnut loaded with chocolate chips made them absolutely giddy with delight. Ha ha, poor deprived monkeys. I’ll leave the judgement to you worldly souls. You can use semi-sweet chocolate chips if you want a sweeter tasting brownie or dark chocolate chips if you want a nice mildly bitter touch to counter the sweetness. I would have used the dark chocolate chips in mine if I had them in hand as I prefer my brownies less sweet. Nevertheless, these came out very well. They tasted even better a day after. I left them out overnight on the dining table covered by a net. Line a 8 inch by 12 inch steel tray or a 9 inch square pan with butter paper/parchment paper making sure it comes up the sides. Mix the Nutella and melted butter in a bowl and keep aside. In a large mixing bowl mix the flour, sugar and baking powder. Add the Nutella-butter combination to the flour mix and make sure they are properly melded. Add the beaten eggs to the mixture and stir well till the eggs are mixed properly with the batter. Add the chocolate chips, mix well and pour the batter into the tray. 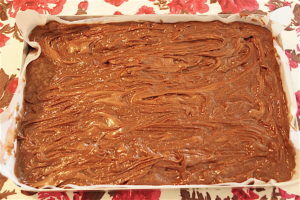 Take the remaining 100 grams of Nutella and drops blobs of it over the brownie batter on the tray. Swirl the blobs with a fork making sure you cover the entire tray and bake in the middle rack of the oven for 25 to 30 mins. 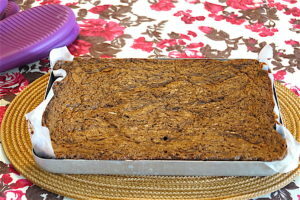 The skewer you insert to test the brownies should not come out completely clean as then you would have over-baked them but they should not be completely coated with a runny batter either. Remove from the oven and cool completely. When cool, cut into squares and enjoy. Important Notes: If you’re using a square pan, you may want to keep the brownies in for about five minutes longer. I only use the heating rods at the bottom of my oven for baking my cakes. If you have an oven where you don’t have the option of turning the rods on the top off you can place an oven tray between the rod and the cake. I don’t use ovens which have only heating from the top. 2. 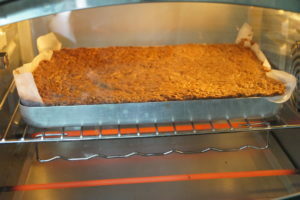 Bake in the oven with the bottom heating on for 25 to 30 minutes depending on your oven. 3. And there you have it. 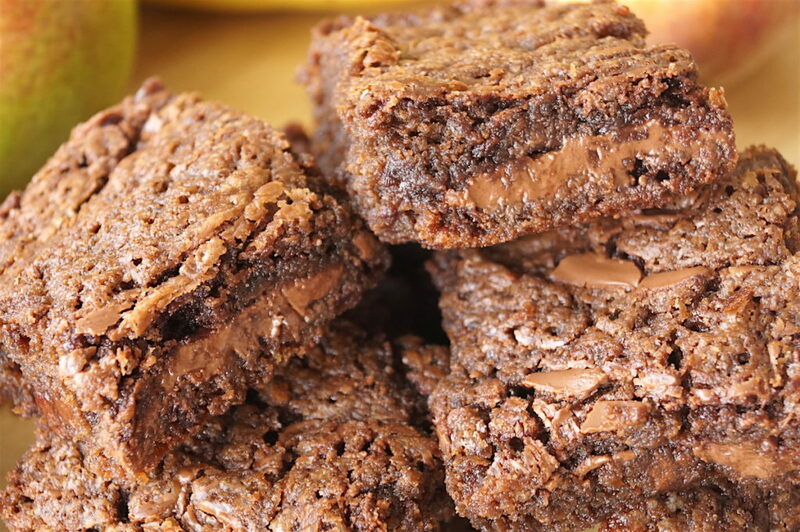 Decadent Nutella brownies.